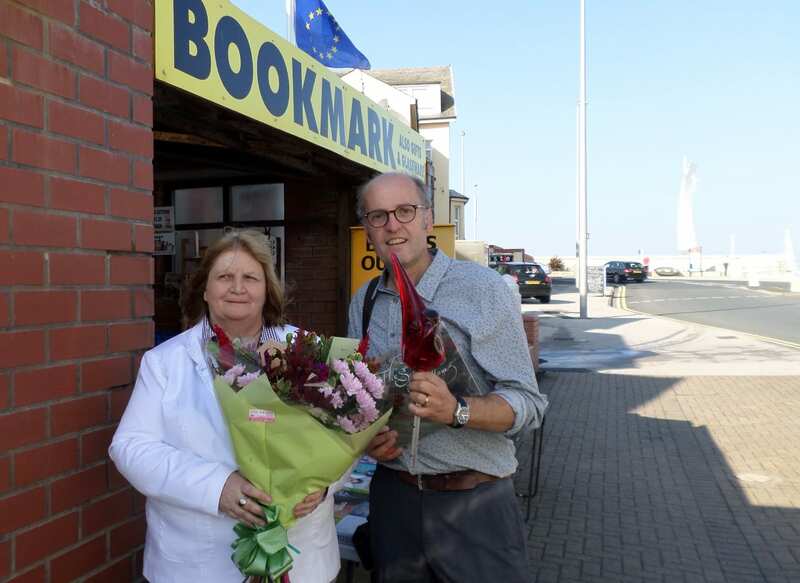 A big thank you to Barbara and Nick Ward of The Bookmark book shop for returning one of Cleveleys’ ‘Sea Swallows’. 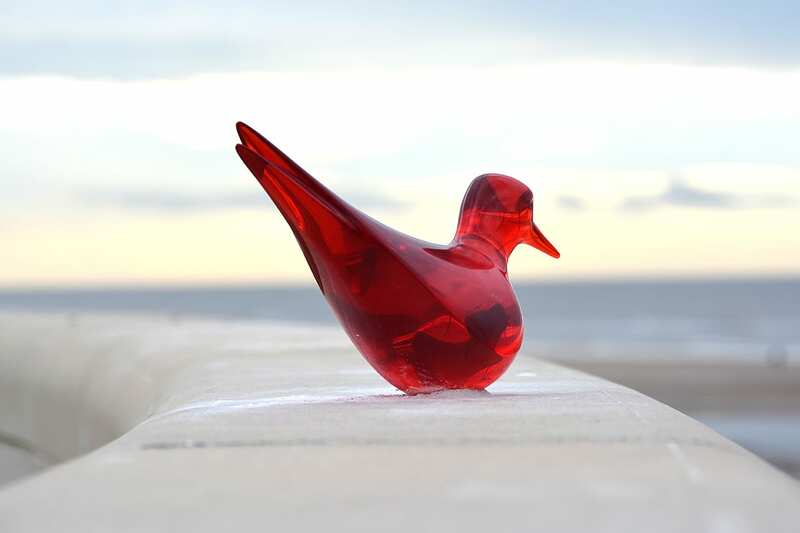 Barbara collects glass and was attracted to the red Sea Swallow which she found in the Red Cross charity shop in Cleveleys, and paid just £6.50 for the sculpture which had originally cost £1000 to make. 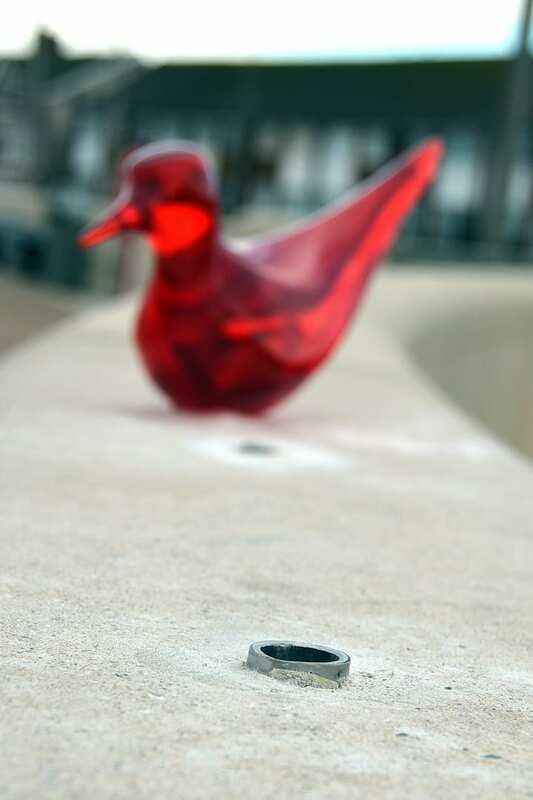 Her husband Nick recognised that it might be one of the resin Sea Swallows from the Mythic Coast Artwork trail on Cleveleys’ promenade. “I am really pleased that the red Sea Swallow has flown home. I think it is absolutely lovely and would have liked to keep it – but I am happy that I have been able to give it back to Cleveleys” said Barbra. The Mythic Coast Artwork trail artist Stephen Broadbent called in at The Bookmark to thank Barbara in person and presented her with a bouquet and a copy of the Sea Swallow book. “I am delighted to see the return of this wonderful bird and hope that the other five that were taken return soon, it would be great to have them back” said Stephen. The other artworks – all designed by Stephen – include the Sea Swallow sculpture at the top of Victoria Road West, the Shipwrecks Memorial and the Ogre’s Paddle all on the on the Promenade. The trail continues down on the beach with The Ogre which is a carved stone forming part of the groyne near Café Cove and The Seashell on the beach nearby. 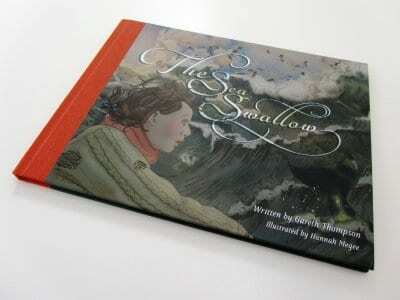 The designs were based on ‘The Sea Swallow’ book specially written as part of the same regeneration project by Gareth Thompson which tells a tale of Wyre’s coastline. 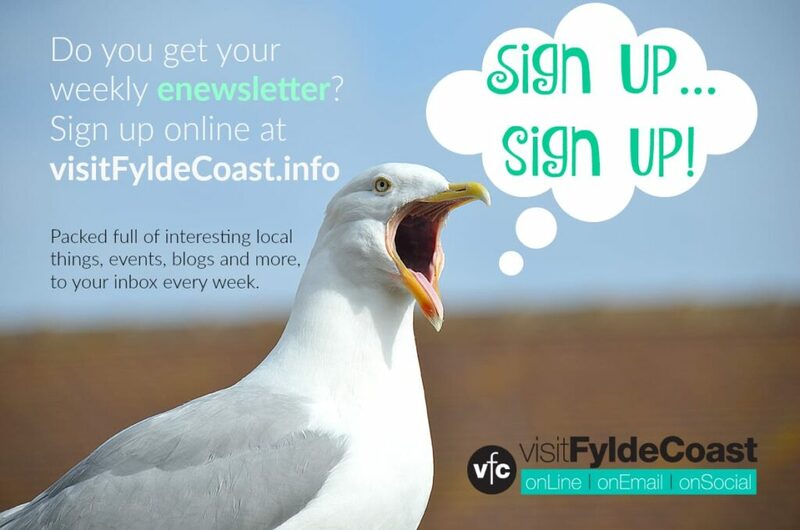 If anyone knows where any of the other five birds are they can contact Wyre Council, email regeneration@wyre.gov.uk or return them to the Civic Centre in Poulton-le-Fylde. 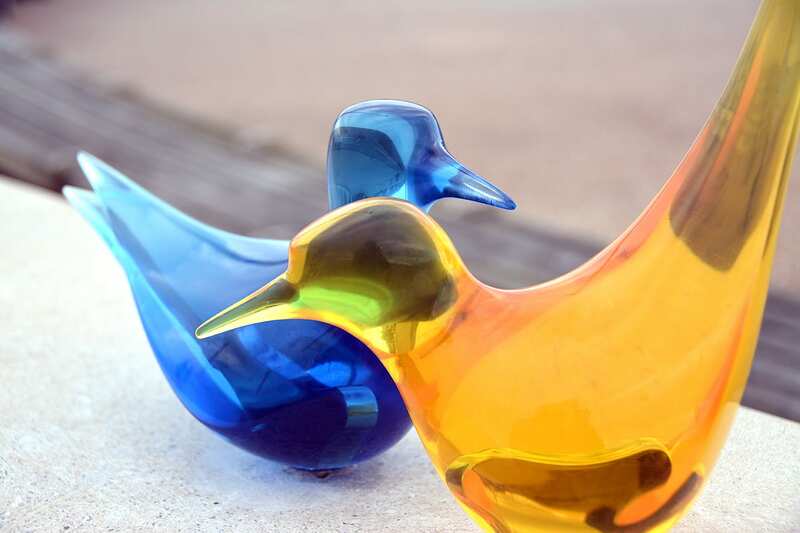 Part of the original public artwork plan, 12 coloured resin birds were originally designed to alight on top of the sea wall at the end of Victoria Road West, where they would be permanently fastened to take in the view. 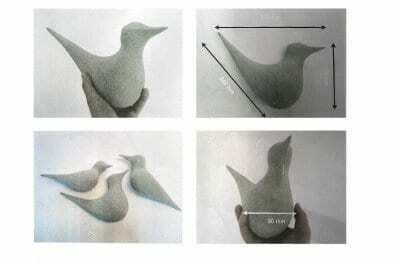 The 12 Sea Swallows were cast in three different patterns and the plan was for them to be sited in various places. 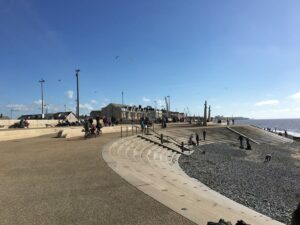 The Sea Swallows were installed on the sea wall in January 2014, and very uncharacteristically for Cleveleys, six of them went missing that very same day. You can see in the photo of the returned bird that each of them had a substantial metal rod extending from the base, which was set and bonded into a corresponding metal socket set into the sea wall. Presumably someone who was quick thinking realised that the time to take them was before the bonding compound had set, as they were taken on the same day. The rest of the birds were removed for safe keeping. Five of the original Sea Swallows are still missing – yellow, purple, pink and two blue ones. The story of the Sea Swallow is brought to life through a public art trail which winds along the promenade from the Shipwreck Memorial, past the Sea Swallow and the Ogres Paddle, the Ogre on the beach and finally arriving at Mary’s Shell which sits on the sand. You can read about all of these pieces of public art, drawn from the book of the same name, in this section. At the very end of Victoria Road West these resin birds were planned to appear, alighting on the top of the sea wall to rest and take in the view. These were the Sea Swallows, 15 coloured resin birds, cast in three different patterns and sited in various places.  Read about the other pieces of public art at Cleveleys with pages in this section. One of the red Sea Swallows, you can see clearly the metal sockets into which they were set.